From Milwaukee to Brookfield people paused to honor Officer Matthew Rittner as the hearse carried his body to Krause Funeral Home. A long line of police vehicles trailed behind. Strangers said they felt moved to come out and pay their respects. "It's mind numbing to see this happen for the third time in less than 8 months in Milwaukee," said Tom Treul who stood outside the Milwaukee County Medical Examiner's Officer with an American flag. "It's sad. It's really sad to me that he is just a young kid. I know he was a man and he was married but having a son that age to me it was a young man," said Cindy Sundholm from Muskego. Those who serve the community like the Brookfield Fire Department stood outside at attention as the hearse passed. For Milwaukee Police Officer Craig Nawotka seeing people caring really matters. "You can see the people on the overpasses supporting us. it's just a sign of respect for the fallen officer and it's just a really nice thing to do," said Nawotka. 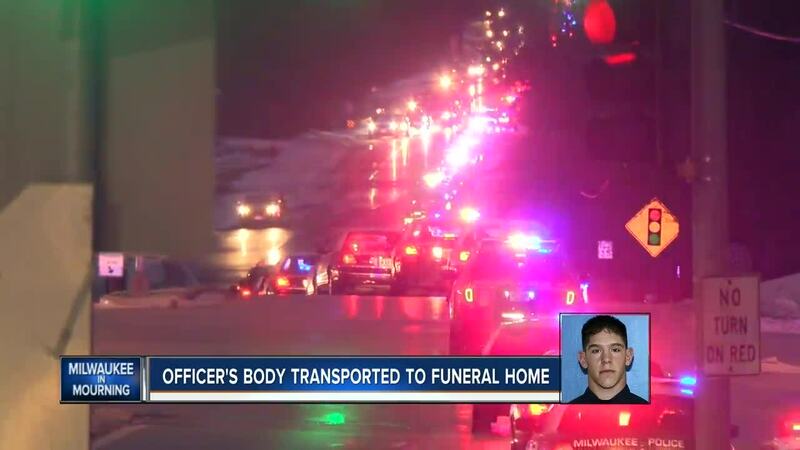 Thursday night, Milwaukee Police stood shoulder to shoulder in the cold watching as the casket draped in an American flag was brought into the funeral home. "It's just so unfortunate, sad, disappointing that this would have to happen. This isn't like an accident. This person made the choice to ruin the lives of a family, a friend, a department, yet again," said Scott Kostrzewa from Milwaukee.